Released from work early on Thursday, I stopped into Kinokuniya, my favorite notebook and pen store in NYC. 15 minutes and $13.55 later, I was walking onto the B train with my favorite notebook (unruled) and two fancy felt tip pens. On this long holiday weekend, I had a notion to fill that book. Fill it with what, I wasn’t sure, but I was determined to do it and convinced it would be fun. 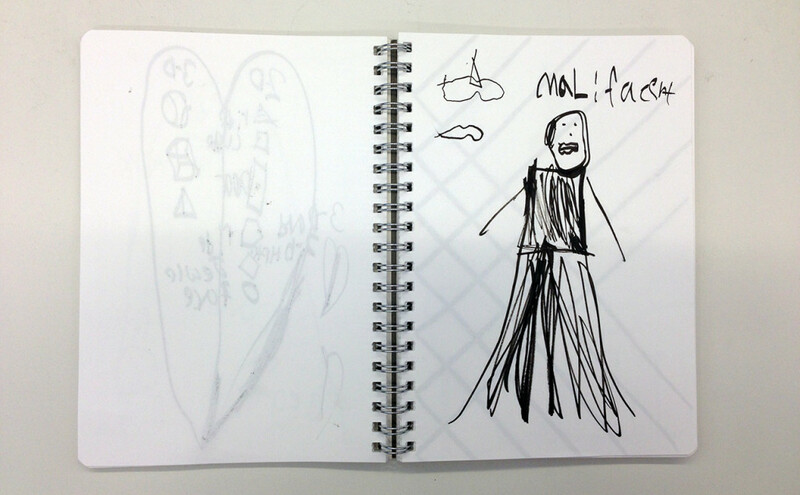 On the very first page it became evident that enthusiasm was in abundance but execution was not. My letters were shaky and crooked as I tried to get a feel for the chisel tip pen. Deep down I knew this wasn’t going to end up being the glimpse into my beautiful mind that I secretly imagined. Charlotte saved the page by drawing, appropriately, a picture of Disgust, the Mindy Kaling-voiced character from Inside Out. Quality issues aside, the going was slow. Who had time? I convinced Maggie and Charlotte to take over for a stretch, which improved the quality dramatically. Charlotte rendered another movie character. Maggie did some blind line contours on Brighton Beach. But by Saturday, it was clear that extra help wouldn’t be enough to fill the whole book. I didn’t help that I forgot to take it to the 4th of July picnic. 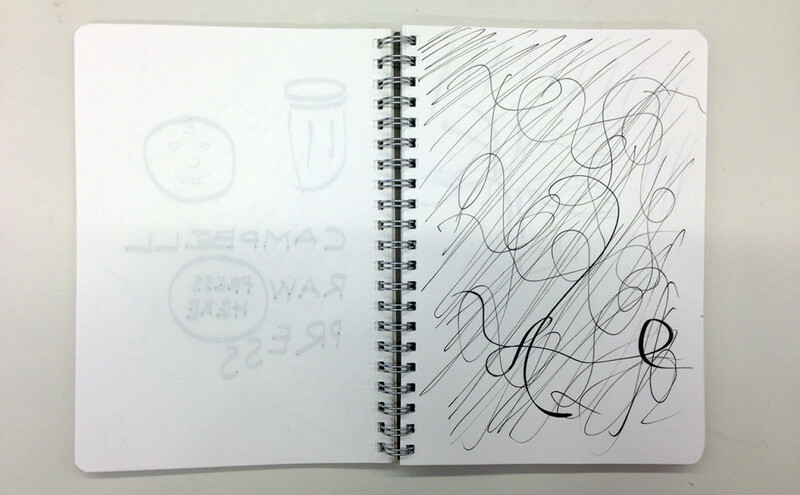 Sunday, I gave up, falling back on scribbles and abstractions to fill space—uncreative doodlings of an exhausted mind. So what was I envisioning, exactly? 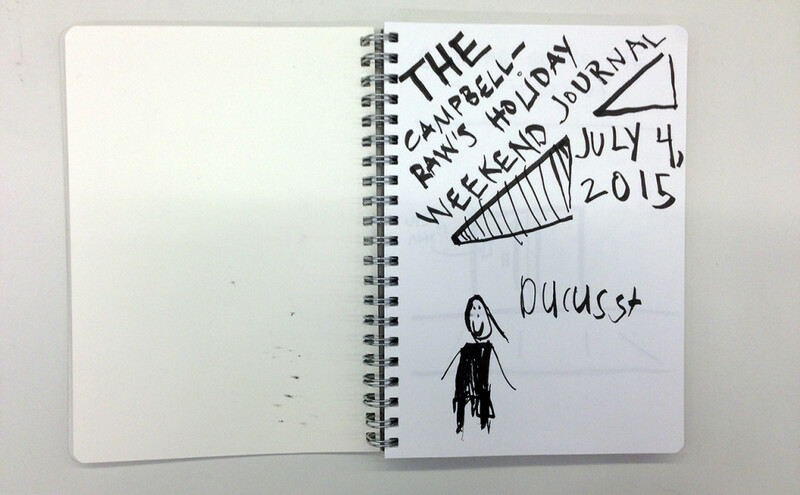 I imagined telling the story of our holiday weekend through a series of simple, artful sketches. 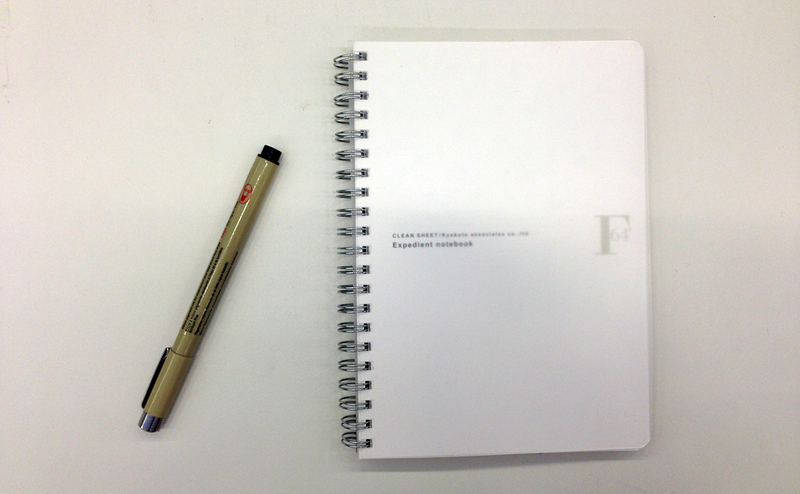 We’ve seen these impossibly perfect sketchbooks many times: every sketch is perfectly composed, no stray or unconfident lines. I imagined the finished product but I wasn’t imagining the work it would take to get there. It was a good goal. I’ll revisit Lynda Barry’s Syllabus, set aside my ego, and try again. But I was reminded that it’s tough to squeeze in new challenges right now, no matter how fun they seem. Even when the energy is there, it’s spent like rocket fuel. Matt! What you HAVE is wonderful inasmuch as it is NOT a blank slate. You can start working with more dominant drawing materials (color?!) and/or collage to work with or against “Disscusst”, Malificent, and those sandals of Charlotte. 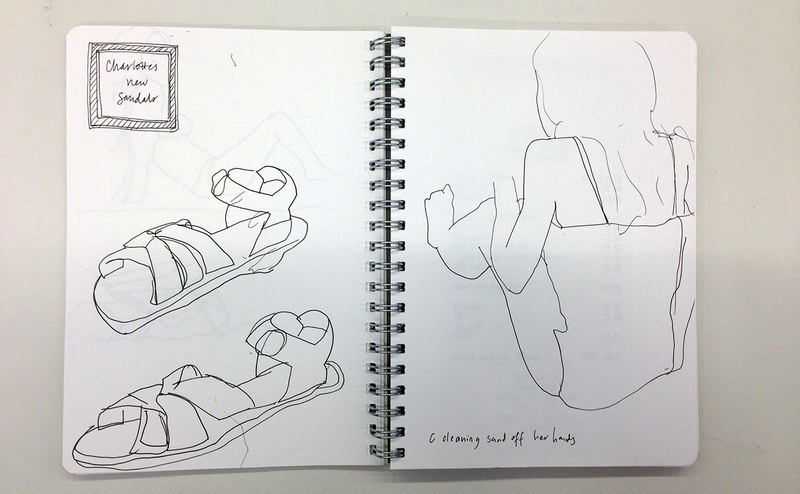 Sketchbooks seem so casual… but, to avoid an exercise in diminishing returns they must become serious… FUN. That said, you should cut yourself some slack with the serious fun of your newly configured household. I love it that 13 Weekends has not been abandoned as you stare down sleeplessness, conflicting demands on your attentions, and summer in the city.